Gallia Academy running back Lane Pullins (28) runs over a Fairland defender during a Week 6 football game at Memorial Field in Gallipolis, Ohio. The Blue Devils will host Newark Licking Valley on Saturday in the opening round of the Division IV, Region 15 playoffs at 7 p.m.
After missing out over the last five postseasons, the Gallia Academy football program will be making its 11th playoff appearance next Saturday night when the second-seeded Blue Devils (9-1) host seventh-seeded Newark Licking Valley (7-3) in a Division IV, Region 15 opening round contest at Memorial Field in the Old French City. The visiting Panthers are just 1-3 against teams with a winning record this fall, as well as being 0-3 overall against opponents that qualified for the playoffs. LVHS, however, will be making the program’s second straight postseason appearance, as well as the 18th overall in program history. Licking Valley was the state runner-up in both 2001 and 2007, and has also been in the Final 4 on six different occasions. The Blue Devils, on the other hand, will be making the program’s 11th playoff appearance — and first since the 2012 campaign. 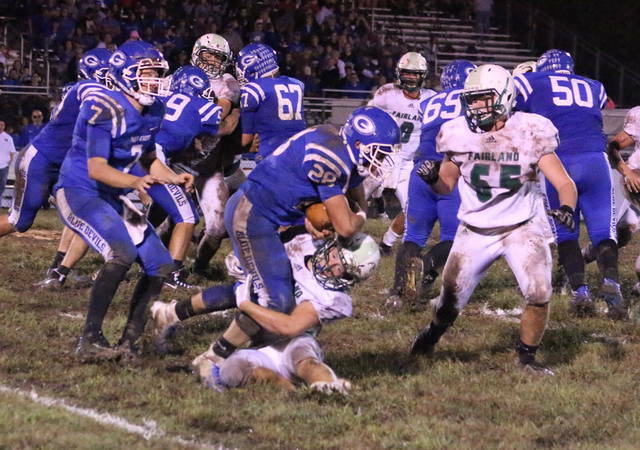 GAHS also last won a playoff game that year with a 37-35 decision over Cincinnati Archbishop McNicholas in the opening round of a Division III, Region 12 contest at Memorial Field. The Panthers will face the Blue Devils on Saturday night at 7 p.m. Here is a complete look at the 2018 OHSAA playoff pairings for all divisions.